Acorn had his tonsils out last week. It's been a rough few days here. Acorn loves Kermit. 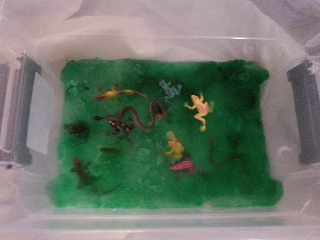 I thought, "hey, how about a swamp themed sensory bin for this long weekend?" Thanks to Tammy at Praying for Parker, I had water gel to use for the base, which I colored with green food coloring. It says a half teaspoon to 4 ounces, but I doubled the water because an early test showed that to be the texture of very firm jello, and I wanted something less thick. 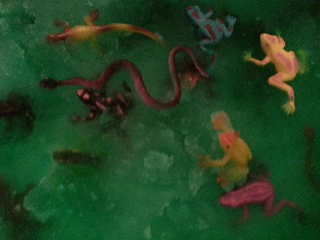 Frogs, snakes, and lizards are from a party supply store. Yeah....he wants nothing to do with it. He touched it, made a face, and shook his hands until it all flew off his hand.